So many of the traditional BBQ recipes are so heavy and filling, I try to serve some light & fresh side dishes to balance out the menu. This fruit salad from EatBetterAmerica will be just perfect! 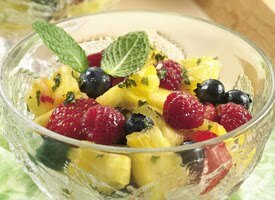 Honey and mint jazz up this quick-to-make berry and pineapple fruit salad with fresh tropical flavors! 1. 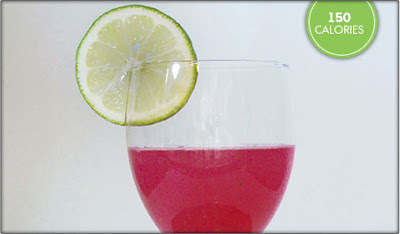 In 1-cup measuring cup, mix lemonade concentrate, honey and mint. 2. In large bowl, gently stir together remaining ingredients. Stir in lemonade mixture until fruits are coated. Serve immediately, or refrigerate up to 4 http://www.blogger.com/img/blank.gifhours. And while you have the fruit & mint out, how about a lightened up Mojito? In a cocktail shaker muddle the blueberries, mint leaves and lemon- lime wedges. Add the crushed ice, lemon and lime juice and Truvia® natural sweetener and shake well. Stain over cubed or crushed ice and garnish with lemon wedge and mint sprig. Calories 150; Total Fat, 0g; Saturated Fat, 0g; Trans Fat, 0g; Cholesterol, 0mg; Sodium, 0mg; Total Carbohydrate, 17g; Dietary Fiber, 0g; Sugars, 1g; Erythritol, 14g: Protein, 0g; Vitamin A, 0% DV; Vitamin C, 20% DV; Calcium, 0% DV; Iron, 0% DV. Do you all have any Independence Day plans yet? We intend to celebrate the 4th of July as we always do: at home, poolside, with family and friends. I've already begun planning and shopping for the menu so thought I'd share recipes with you as we go along. I've been making this bean salad recipe since I first discovered it in a Vegetarian Times magazine, circa August 1996. It's been toted along to more potlucks and family gatherings than any other dish, is popular with meat-eaters and vegetarians alike. Stay tuned, I'll be posting at least one healthy holiday recipe per day as I firm up my Independence Day menu! Knowing that it will likely be a busy day at the office, I went ahead and prepared today's meal in advance. All we'll have to do tonight is add a touch more pasta sauce and pop a plate into the microwave, add a nice green salad on the side and voila! Dinner is served! I found this dish on Allrecipes; I just tweaked the ingredients a bit to make it healthier. Cook pasta in boiling water for 8 to 10 minutes, or until al dente; drain. Bring 1/2 cup water to a boil in a saucepan, and cook the spinach 4 to 6 minutes, until tender. Place the cooked pasta in a medium bowl. In a small bowl, whisk together the eggs and oil. Toss the pasta with the cooked spinach, egg mixture, and bread crumbs. Cover the bottom of a 9x13 inch baking dish with 1/3 of the pasta sauce. Pour half of the pasta mixture into the baking dish, and cover with another 1/3 of the pasta sauce. Sprinkle with half of the Cheddar cheese and half of the mozzarella. Layer with remaining pasta mixture, and top with remaining sauce. Sprinkle with the rest of the Cheddar and mozzarella cheeses. 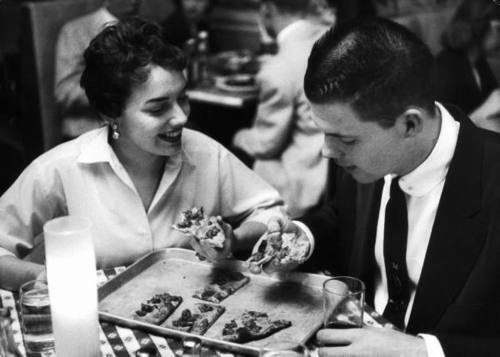 Bake 45 minutes in the preheated oven, or until bubbly and lightly browned. Per Serving: 247 Calories; 8g Fat (30.5% calories from fat); 16g Protein; 27g Carbohydrate; 2g Dietary Fiber; 50mg Cholesterol; 379mg Sodium. Exchanges: 1 1/2 Grain(Starch); 1 1/2 Lean Meat; 0 Vegetable; 1 Fat. I've been craving some good old fashioned barbeque but, alas, our grill down here is broken. I had to "make do" by using my crockpot for this amazing Slowcooker BBQ Chicken, a recipe I've made many times for my family. Since I'm watching my weight and cutting down on meat, I decided to make a veggie version using Quorn Naked Cutlets, 2 Tablespoons of Stubbs BBQ Sauce served on a light whole-wheat hamburger bun. Alongside Pasta Salad (see recipe below) and steamed broccoli, this dish fulfilled my BBQ craving without compromising my diet! This whole meal only cost me 8 Points+! Boil the pasta according to the directions on the package. Be careful NOT to overcook your pasta. When pasta is done (I suggest al dente), strain, and put in bowl. Let the pasta chill in the refrigerator for about 10 minutes, or until the pasta is slightly chilled. Add the tomatoes, cucumbers, Italian dressing, and red pepper flakes. Toss thoroughly and serve, or chill until ready to serve. They say that breakfast really is the most important meal of the day, and I believe them. 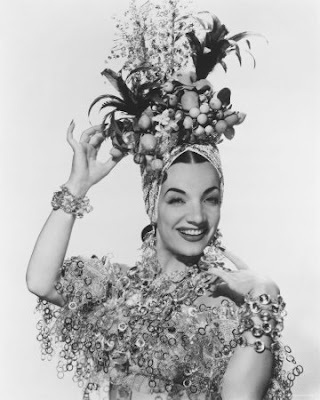 I never, ever skip breakfast and always make sure it's a substantial one. I've found that I need protein in the morning otherwise I have a terrible 10 o'clock slump that has me eying the donut tray at the office! Now, if you're assuming that I mean the traditional high-calorie bacon & egg meal, think again! There are many other protein-rich food sources that'll provide the nutrition and energy you need to start your day. One of my personal favorites is a Breakfast Wrap. 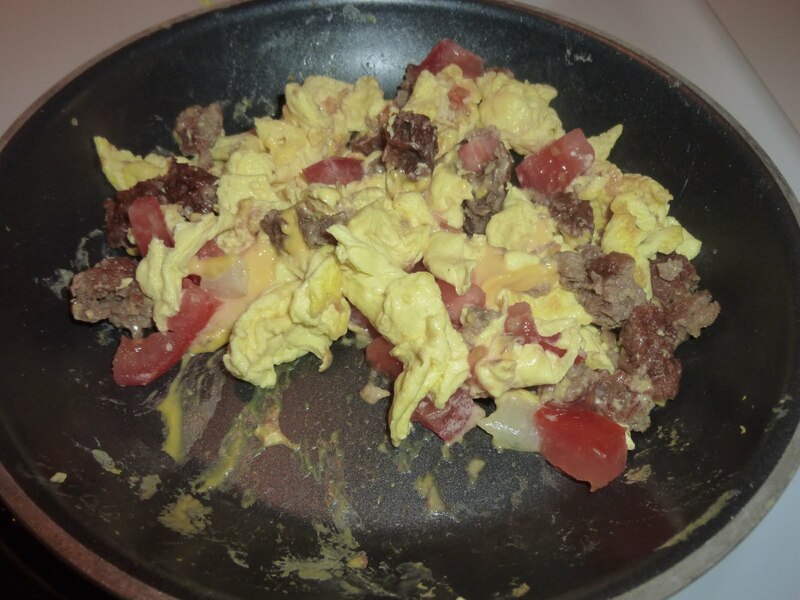 I start off with 1/2 a cup of Egg Beaters, scrambled with a slice of veggie cheese and a veggie sausage patty which I've broken into pieces, add some mushrooms, onion and a bit of fresh diced tomato. I then roll all of that into a FlatOut Light flatbread and dig in! 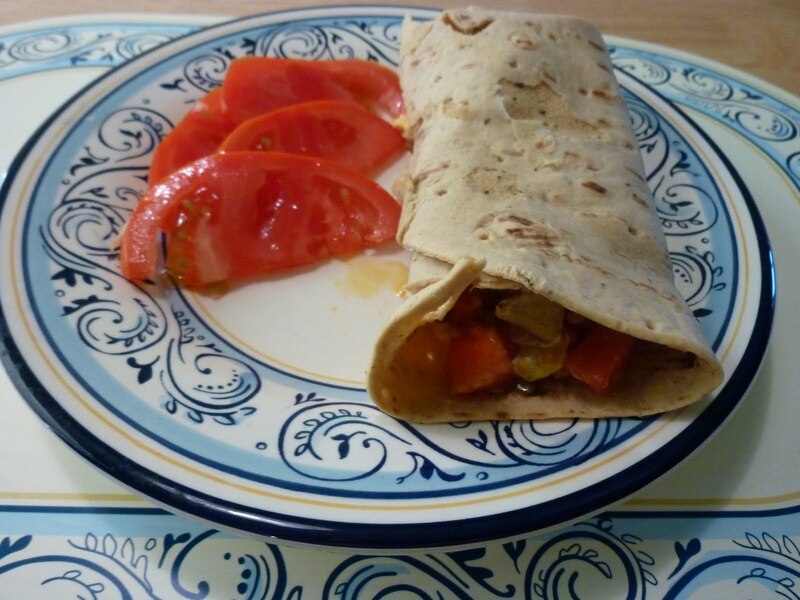 So filling and delicious and all of it for only 7 Weight Watchers Points+! 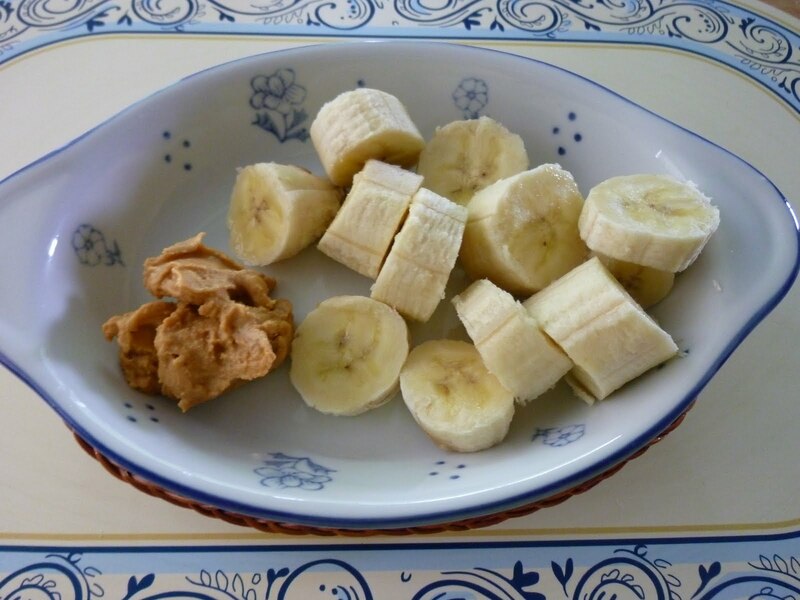 Around ten thirty I'll often have some fruit and bit more protein, an apple or banana dipped into PB2 works perfectly and only costs me 1 Points+! Beren and I took a little drive to the "country" this morning, visited a Farm Swap about 30 miles away. I was really excited about the prospect of fresh produce and eggs and wasn't disappointed! I can't wait to dig in! 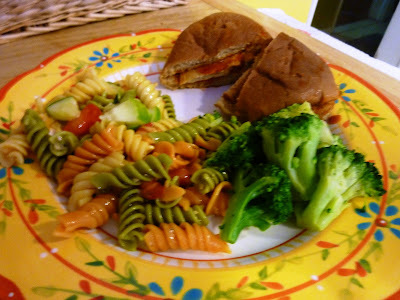 Looking for a way to honor Meatless Monday and use up some of the pasta I bought on sale last week, a quick search of Ronzoni's website led me to this tasty-looking dish. I plugged the ingredients into the Recipe Builder, allowing for 8 (3/4-cup) portions per recipe. Cook pasta according to package directions. In large saucepan, heat olive oil over medium heat. Add onion and sauté until tender, about 5 minutes. Add eggplant and sauté 2 to 3 minutes longer. Stir in stock and cook until eggplant is tender. Stir in tomatoes and simmer until heated through, about 2 to 3 minutes. Toss cooked pasta with eggplant mixture and basil. Season to taste with salt and pepper and served topped with cheese. We Americans could learn a thing or two from the Italians! This is an older Weight Watchers recipe using the former POINTS system so if you follow that program, you may want to plug this into your Recipe Builder to determine Points Plus. 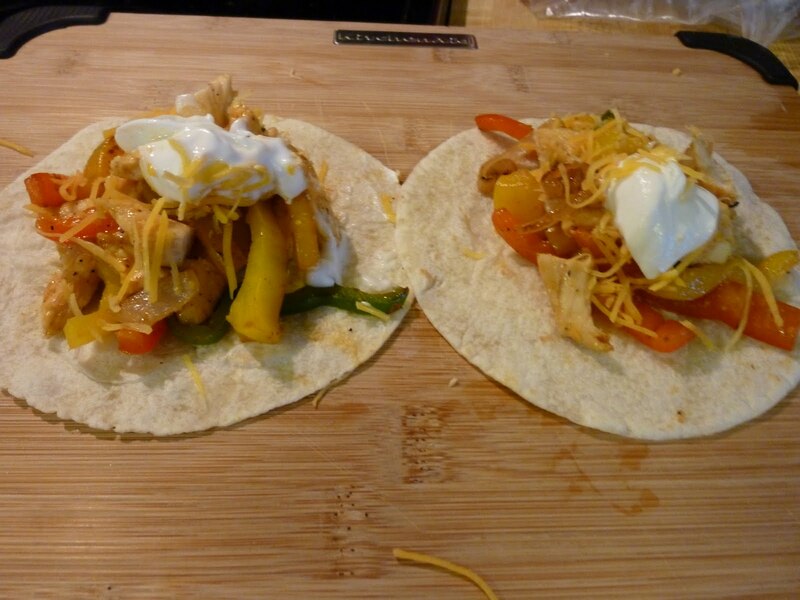 I had fresh peppers on hand so I used them instead of frozen, also topped the finished fajitas with a little bit of fat-free sour cream...sloppy & spicy and oh-so-delicious!! 1. Place a large nonstick skillet coated with cooking spray over medium-high heat. Add chicken and seasoning; stir-fry 2 minutes. 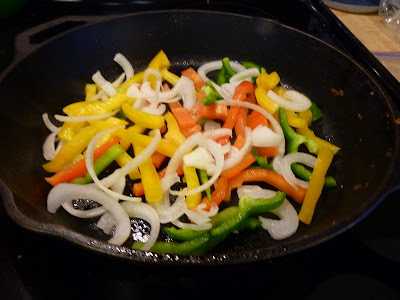 Add bell-pepper stir fry; stir-fry 2 minutes or until chicken is done. 2. Warm tortilla according to package directions. 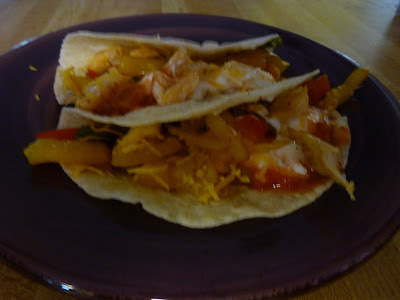 Spoon 1/2 cup chicken mixture down center of each tortilla; sprinkle each with 1 tablespoon cheese. Roll up. Top with salsa, if desired. This is an older recipe with the former POINTS but if you're on Weight Watchers you could easily convert it using the Recipe Builder. I used vegetarian sausage patties, a little less cheese and a few more peppers & onions atop a thin crust to cut down on the calories. It was delicious and very filling! Heat a large nonstick skillet coated with cooking spray over medium-high heat. Add sausage; cook until meat is browned, stirring to crumble. Drain well. Stir in pizza sauce. 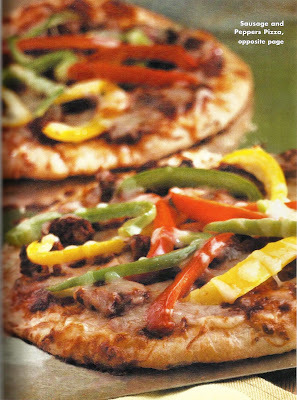 Spread ¼ cup meat mixture over each crust; top each with ½ cup bell pepper strips sprinkle each with ¼ cup cheese. Bake immediately or allow to cool, then wrap tightly in foil and freeze. To bake immediately, preheat oven to 425. POINTS 5. Per serving: 228 calories, 27.6 Carbohydrates, 5.9g Fat, 0.5g Fiber, 13.3g Protein, 19mg Cholesterol, 643mg Sodium, 251mg Calcium. 1.9mg Iron. There was a slight change of menu for last night since I didn't have all of the ingredients for the Thai-Style Shrimp (how did I run out of Better'n Peanut Butter?). That recipe will wait for another day but in the meantime I decided to use what I have on hand. I tweaked this Hungry Girl recipe, substituting some veggie Italian Sausage links that have been languishing in the back of my freezer. They are a bit higher in fat/calories than I like but they taste soooo good, totally worth it! 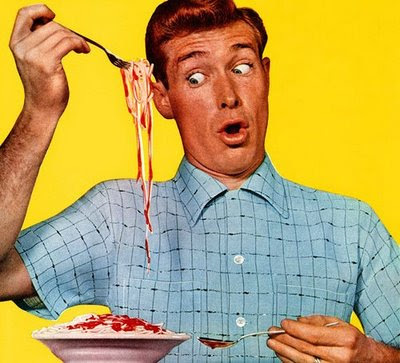 Besides, do you know how much a traditional plate of spaghetti & meat sauce will "cost" you, nutrition wise? Yikes! I'll stick to my version, thank you very much. Drain and rinse noodles; pat dry. Microwave for 1 minute, then pat dry again (the more water you soak up, the better the end result). Set noodles aside. Prepare sausage link on stovetop with nonstick spray and set aside. In skillet, heat Boca Ground Burger for approximately 3 minutes. Cut sausage into bite-sized pieces. Combine sausage, Boca meat, noodles, sauce and cheese, and mix well. Microwave entire dish for one additional minute.